THE UNION REPRESENTING CityJet pilots in a dispute with management don’t understand the aviation business, according to the airline’s boss. 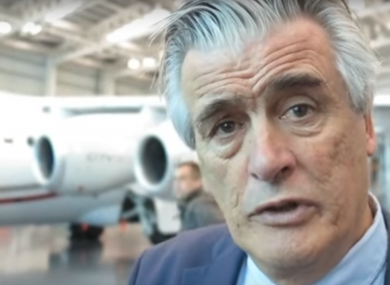 CityJet founder Pat Byrne added that his company is willing to thrash out a deal with pilots but is being frustrated by the Unite union representing them. During the week, CityJet pilots represented by the Unite trade union pledged to strike during 13 days in November and December following a row with management over several issues, including pay. CityJet has said that it does not envisage that the strikes will cause any disruptions to flights and that it is looking to engage with the workplace relations commission (WRC) to resolve outstanding issues. However Unite claims the airline has refused to allow the WRC to refer the dispute to the Labour Court. Speaking to Fora, Cityjet executive chairman Byrne said that the company is willing to thrash out issues, but he claimed that Unite was being unreasonable. “I have a pain in my backside from Unite, because we have tried to negotiate a new pay deal, new terms and conditions with our pilots,” he said. “Unfortunately, every time we’ve done it, and we’ve been through the machinery, they don’t want to talk about the pay deal. In 2007 CityJet was taken over by Air France. The Dublin-based airline was bleeding money afterwards, recording losses of more than €50 million in its 2009 and 2010 financial years. In 2012 Air France, itself struggling with high losses, decided to put CityJet up for sale. The Irish company was acquired by German investor Intro Aviation in 2014. Intro sold the airline back to Byrne, CityJet’s original founder, and a group of private investors. Byrne returned to CityJet in 2015, and the deal with Intro was officially concluded earlier this year. CityJet made a loss of €30.6 million in the year to the end of 2014, the most recent year for which its accounts are available, down slightly from the €38.6 million loss recorded the year before. “Unite do not understand the flying business. We have 300 pilots in our company. We respect and have excellent relationships with unions in everywhere we operate,” Byrne said. However Unite officer Willie Quigley rejected the suggestion that it did not understand the industry, claiming that management was using that as an “excuse” to try to replace the union. “We have loads of associated airline workers in Aer Lingus and in Belfast and London. That is an excuse to get IALPA (Irish Air Line Pilots Association) onto the pitch,” he said. He added: “CityJet’s pay offer was rejected, they said they would go to the Labour Court and they reneged on that commitment. CityJet, which has its headquarters in Swords in north county Dublin, flies to several European cities including Paris and Florence. It also has a base in London, and began flying from Cork airport last year. Email “CityJet's boss says striking pilots' union is 'a pain in my backside'”. Feedback on “CityJet's boss says striking pilots' union is 'a pain in my backside'”.